In terms of GLBT inclusion, since Dark Dates, Sinclair has included several LGBT characters though the portrayal hasn't always been perfect. In Angel Falls, Sinclair introduces us to a gay male couple and another lesbian. Over all Media and Katie have had the most functional relationship in this series though it's problematic that the major issue they face is resistance of the fact that Media is a Wiccan and Katie is a shifter. In the real world, they would face homophobia and of course problems for being in an inter-racial relationship. I don't think that a little more focus on this would take away from the fantastical element of the story and it would make it all feel a little more realistic and relatable. 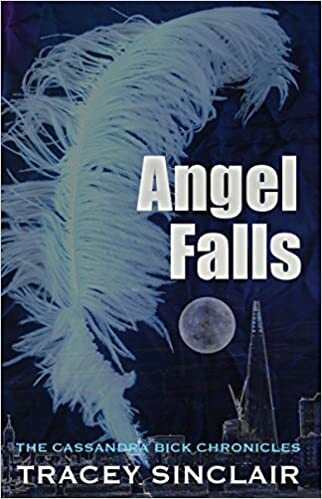 There were a lot of interesting elements to Angel Falls; however, at times the story felt like it just had too many moving parts and couldn't settle into a clear narrative. If that were not enough, it ended on a cliffhanger which I have long felt is a writer's device to draw the reader into the next novel. If you haven't sold the book by the last few pages, you're not going to sell it, thus making cliffhangers completely unnecessary and extremely annoying. There had to be a better way to set up the next book than a cliffhanger. That being said, while Angel Falls wasn't nearly as polished as Sinclair's other work, it's a decent continuation of the story.